Well from what I can see at the link and recognizing some of the streets, I'd say The Bus Driver better pray his military doesn't walk away from the base where the Presidential Palace is and just let the mob have him. I had to take a break because the footage is unedited (I am amazed it is being shown) and the screaming (mostly of crowds cheering) was getting to me. There does seem to be a whiff of "the best Revolution that outside money can buy" on this one; but on the other hand at this point, I don't think that the people there care very much about outside funding, they just want their current situation to be over and hopefully improve. Looking at the sheer NUMBERS in the streets, Maduro's time is running to an end, DAMN QUICKLY!!! So we will now either have a successful "revolution" or a civil war; I hope for the first as the second would really be horrific if it went on for any length of time. And NOW it's unfortunately time for PDJT to either "defecate or abdicate" on Diplomatic Recognition of Guiado…..
Yeah this is shaping up to be a REAL fun week. Picked the wrong month to catch the crud...and quit drinking OR snuffing glue. #BREAKING: Canada and the Organization of American States are now recognizing Juan Guaidó as the new president of #Venezuela - @AFP , @CBCAlerts. Canada is now recognizing Juan Guaido as the new president of Venezuela, following the US' lead. Watch for other US allies to do the same. Deputy of the National Assembly of Venezuela calls for the military to decide on which side they are. As a newbie, I wasn’t sure who or how to contact staff about this thread I started on 1/12/19. Could I request a change please? See that little triangle next to "Blog this post"?? "When we say all options are on the table that means all options are on the table." But, official notes, "In our sanctions, we've barely scratched the surface on what actions the United States can take." If Maduro "chooses the route of violence... let us be clear, we have a host of options." They will "have their days counted," official says in last remarks. Newsfeed for Univision keeps going dark or slowing down so much it doesn't work but at least they keep trying - mostly people running through the streets last time I got it to work for a minute or so. BREAKING NEWS: Reports of several people dead as pro-Maduro forces open fire on anti-Maduro protesters in several locations across Venezuela. It's nuts down there right now. I'm not even going to attempt to keep up. 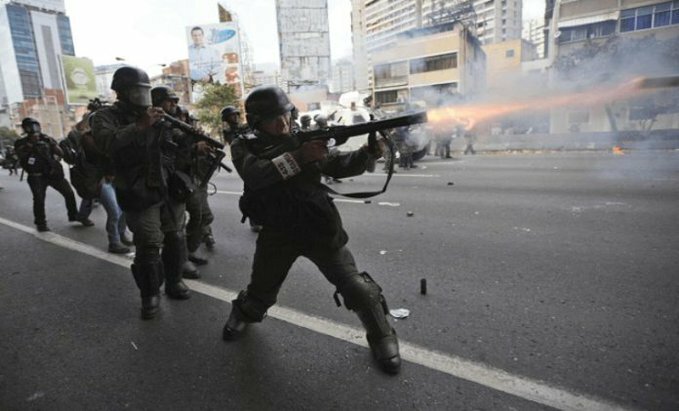 #Update: Pictures of Heavy clashes right now between Pro-Maduro security forces and opposition protesters in central Caracas in #Venezuela Picture credit: "Rafael Hernández"
#Breaking: Now more live ammo warning shots fired in #Caracas in #Venezuela, between Pro-Maduro security forces and protestors. This is now definitely not going to end well. A point to consider here is that the Romanians were in better shape than the Venezuelans are when they had their "regime change". #Breaking, #Venezuela: #Maduro is publicly speaking right now. All American personnel told to evacuate Venezuela immediately. #Breaking: President "Maduro" of #Venezuela to announce that he will be not stepping down as acting president. Normally PM Justin Trudeau of Canada would not have endorsed this move because he supports Communist/Socialist dictatorship on things like the universal Immigration through UN. But his votes come from Eastern Canada which also imports cheap oil from Venezuela instead of buying domestic oil from Western Canada, and he can't afford to upset his voting base by having sanctions put on Ven. oil which Pres. Trump has threatened. Economic Sanctions by the USA are more harmful to Trudeau's voters in Canada than accepting a conservative .gov. in Venezuela. Blows around like a feather in the wind.....whatever will get him elected. UPDATE - on Fox News 12:24......all US persons to leave Venezuela immediately - .gov or business wasn't stated, but I imagine kidnapping for extortion will be a problem quickly. OMG, again I think this will either sort very quickly or a nasty civil war with US intervention directly or indirectly is getting more likely by the minute.